This is most probably my last blog post before my twentieth birthday, and so I thought rather than be boring and thoughtful and make some sentimental review of the past, I might instead look to the future and let you in on a little plan I am developing for this summer! With the problems with finding jobs this Summer me and my brother have been working on a ‘Ghost Walk’ around Maldon, a town near where we live. With my brother loving acting and me loving history (especially social history), we’ve been researching for a few weeks now and are slowly getting the walk together. So, fine and comendable reader, I would suggest, should you find yourself in this part of Essex any time over the summer, that you may enjoy a small tour around that fine town upon some misty evening and hear tales that have troubled the residents of Maldon for centuries past. As part of my work for the walk I have set up this website to keep track of what is going on, hopefully soon to have a date of a first walk on it. It is high time, I think, for another draught of that sour drink known as yet one more attempt at a notable and sensible blog post, and, good reader, I ask you to prepare yourself yet again for dissapointment at the outcome. I have been enjoying the poetry of George Lord Lyttelton, who wrote poetry during the eighteenth century in a style that I haven’t always enjoyed as much as I have recently, that style being a classical heroic verse. One poem of his that I have especially enjoyed is called ‘The Progress of Love’, and is delivered in four eclogues, each one dedicated to a different person whome Lyttelton knew. It follows a single lover through courting a lady and through the ups and downs of their love, I was struck by the language and how the poem draws you into it unlike many of its other contemporary works by other poets. I must admit, I decided to try and write a poem inspired by Lyttelton’s work and so have begun a poem called ‘The Progress of Averice’, also in four eclogues, below is the first of these four (I appologise for the basic nature of this work, it is my first time attempting a classical heroic style). Of Shakespeare’s verse or Dryden’s stagery. Some fault of greed that yet has stayed unclear. Than some well savoured pounds; one thousand score. Until with fortune’s gems he’d fill’d his plate. To this fine young man b’fore he took his leave. She then quick quitted that fine bakery. Had ventured to London for riches and glam’. And quickly from out of it some fortune grew. His idea was copied; and David cried farce! He drew out a notice to restore his pride. “My cup is not full till filled up with fame. “So long as I’m richer than Greece’s throng. It drives to madness many before they reach their goal. It has been some time since my last blog post, for which both circumstance and lack of time may be responsible, and in what a state I find the internet upon my return in strength to my blog for this simple post! Perhaps, first, I might revel over a good week passed before I turn to my annoyance at the ways of the internet over those same days. I’ve had a great week, having spent a few days with my amazing girlfriend Rosie and her family, as well as visiting London a few days before that, and also seeing friends from home who I’ve missed while at university. Right now I find myself back home and rather gladly adding these honest few words to my lowly blog. Now, something that has annoyed me somewhat are the actions of one website against another, strangely enough, something that I suppose isn’t talked about that much, but we must remember, I suppose, that websites are each businesses and each act as such, and similarly, as businesses are, some are fair and others are greedy &c. I personally have always seen websites as much co-workers as they are competitors, since no one website can control everything and the more there are linking to each other the better they all can function, and only over-saturation is something to worry over. It seems, however, that at least one of the parties involved in this latest dispute has failed to notice this idea and is instead getting carried away with proving their own strength. As you may or may not know, I am a fan of The Oatmeal, a web comic that is filled with all sorts of random bits to make you smile. The guy who creates it has always had a lot of trouble from other websites stealing parts of his comics and posting them without any copyright permission or saying who they’re by, last year he posted about one called FunnyJunk, which takes a lot of different images and puts them on the website, before making a lot of money from advertising (The Oatmeal was more annoyed that they made a load of money off of other people’s work). FunnyJunk sent an email to all their users saying that The Oatmeal wanted to go as far as shut them down, a little over the top perhaps, but at least they removed a number of comics from The Oatmeal that they were hosting illegally. And there I’d have thought everything would have ended, there were still hundreds of copies of The Oatmeal’s comics on the site, but they were mainly badly named and harder to find and delete, so fair enough that they stayed up there. (I do hope, dear reader, I am not boring you, for this is a good vent for me.) It is almost a year on now and, for some reason, things have heated up again, as they far too often do on this fair plain of technology. Basically, this letter has been sent to that very fine website, The Oatmeal, and demanded $20,000 for less than obvious reasons. In perfectly Oatmealish style the comic has ridiculed the demand and has now set up a charity campaign to raise $20,000 dollars and instead split it between two charities. This campaign to raise money has also now been threatenned by FunnyJunk… even though it is entirely for the benefit of others. Anyway, FunnyJunk have had little success so far and The Oatmeal has raised $187,876 within a week, and still a week to go. I thought today that I might explain one of my interests that has thus far not been presented upon this humble blog, that being my interest in bookbinding, a practice that I only began just about a year ago and which I have had put to use both repairing some books I already own, as well as producing new books for my own use. The reason I’ve decided to suddenly add this part of my life into my blog is that I recently filled my notebook of general ideas, in which I’ve recorded every random thought that was of note for the last four years, and which I have been using since I filledup its predecessor. The two notebooks that bore that purpose previously have both been second hand; the firsta notebook originally used by my dad for work, then one I used for archaeology notes, before it finally became my general notebook, and the second a notebook that my grandad left largely empty after he died. I’m not sure why I gave up on second hand notebooks this time around, they’ve certainly worked out well enough before, maybe I was just bored after getting back from university and wanted to make something. Anyway, hopefully in this post I can briefly describe to you my new notebook, what went into binding it, and give you enough of an introduction to bookbinding that I might expand upon it in later blogs and perhaps, should it interest you, dear reader, inform you enough that you might make your own similar books should it interest you. 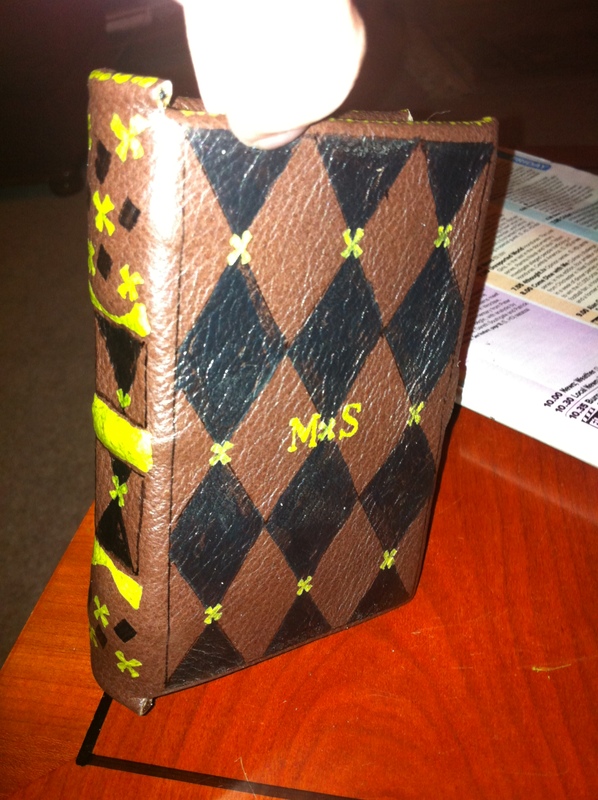 I must admit, my bindings are not particularly usual compared to the very fine modern leather bindings that you can find being made by skilled binders; my books are bound using methods very similar to those of medieval monks, and the binding artwork itself is very much in that style. But first with the simple details, a book always begins with the pages and I hapenned to find a lovely stack of paper amongst my art stuff that I can only suppose had come from my grandparents, the paper itself was probably several decades old looking at it, so somehow I think I’m still continuing on using second hand materials… I tried a new method with these pages and instead of cutting them into shape I folded and tore each edge to give it a more artistic, handcrafted feel. These then need to be sewn, each few pages being grouped together into ‘folios’ and sewn along the spine fold of each group. I then sewed these onto some strings to hold the groupings together, glued the covers onto each side of the strings, added the leather, and finally coloured parts of the leather with black and gold inks. I left the inks on the book to dry and finally secured them with fixitive spray, giving my my new (pocketsized) notebook! I am presently enoying my last night in that finest town; Aberystwyth, tomorrow I will be off home and far away from all the faces and places that have been the centre of my life for the last eight months. My mood is hard to put a finger on in one word, I am certainly not too sad to leave, for there is enough planned this summer to keep me interested in the world outside this beautiful place for at least a while. However, in packing I found a copy of a poem I wrote back in February last year, and was only the second rhyming poem I wrote after moving away from non-rhyming pieces. Anyway, it sums up my mood rather well and, good reader, should it please you I thought I might share it with you. To think of mountains tall. Play snooker when you’re four! With all its maps and files. And get on with our talking! But that seems twice as hard. Than miss one far off smile! – 1.3.1: What is a cover image? – 1.8.3: Good luck and Have Fun! The program I will be using for this tutorial is called Sigil, different versions of which are available at http://code.google.com/p/sigil/downloads/list. I have not experimented outside of Windows, but there is a Mac version as well as a link to compile a version for Linux users. If you haven’t already, load up Sigil. Along the top there is a menu bar with File, Edit, View, &c. running along it, go onto the File drop down, hover over New… and then press New Book (this can also be achieved by pressing Ctrl-n). Along the top you have your menu bar with File, Edit, &c. along it, below that a few menu bars of buttons to do the most common procedures such as add images, chapters, &c. Below these are three panels arranged next to each other; a left hand one for managing files within your eBook (such as images), the central panel which is basically how your eBook will look, and a right hand panel for managing the contents page. 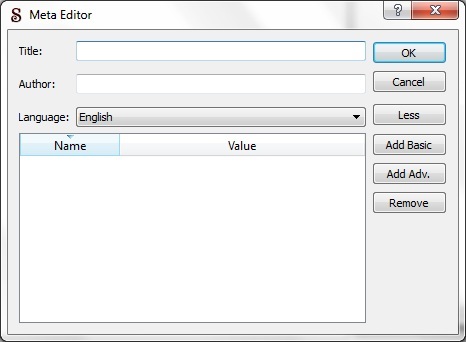 Right at the bottom of the program is a managing errors and validation, which will be explained in a later tutorial. If you cannot see the bottom box then press the More button to the right of the Language drop down menu. Now you can enter the title of the eBook and your name/the author’s name. There are a number of other details you can add such as copyright information, this can be done by pressing either Add Basic or Add Adv. and browsing through the options listed therein. 1.3.1: What is a cover image? 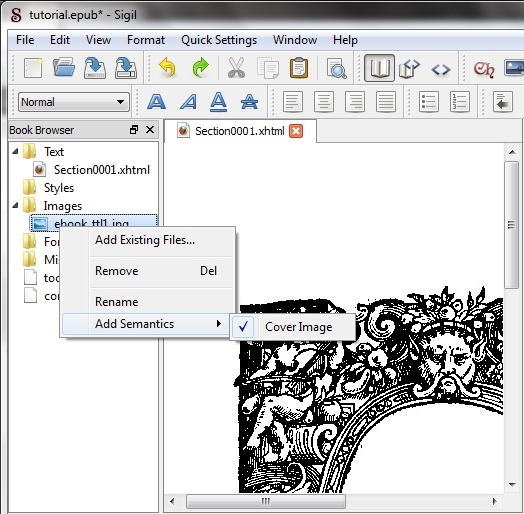 A cover image, simply, is the image that appears on the cover of your book before the reader opens it, for example, the books shown in the following screenshot are the cover images of books which can be pressed to open them. Cover images should be no more than 590×750 pixels, or you can download a template from here. Now go and design an amazing cover image if you don’t have one already, yes it has to be amazing, the program will only accept cover images of 85%+ amazingness or 70%+ awesomeness. No exceptions*. This will import the image into the eBook files, making it available to insert, do this with any images you want to include in your eBook. Now you have your image available in the eBook files you want to know how to insert it, simply select where you want it to be in the central white box (Where you may have already found out you can type), if you are not sure what this is it should have a tab over it called Section0001.xtml or something like that. Now go onto the Edit menu on the menu bar along the top and press Insert Image…, alternatively you can press Ctrl-Shift-I. A window will appear asking you to pick an image to insert, there should be a list of images that you have imported, browse through this until you find the image that you want and press OK. 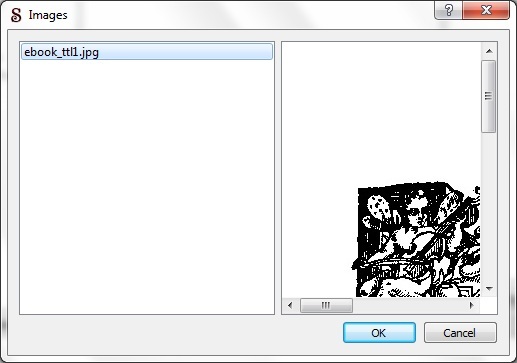 If an error message appears try adding the file into the program again, note: unusual image types may not be accepted, if you are having difficulty try changing the image to jpg and try importing it in that format. The image should now have appeared in the central window. You may want to have a cover image for your book (this is recommended as it will make your book seem more proffessional as well as interesting), there are two ways of doing this, the first is simply to make sure that it is the first thing that you insert into your book – this will usually mean that the program by default sets it as the cover image. 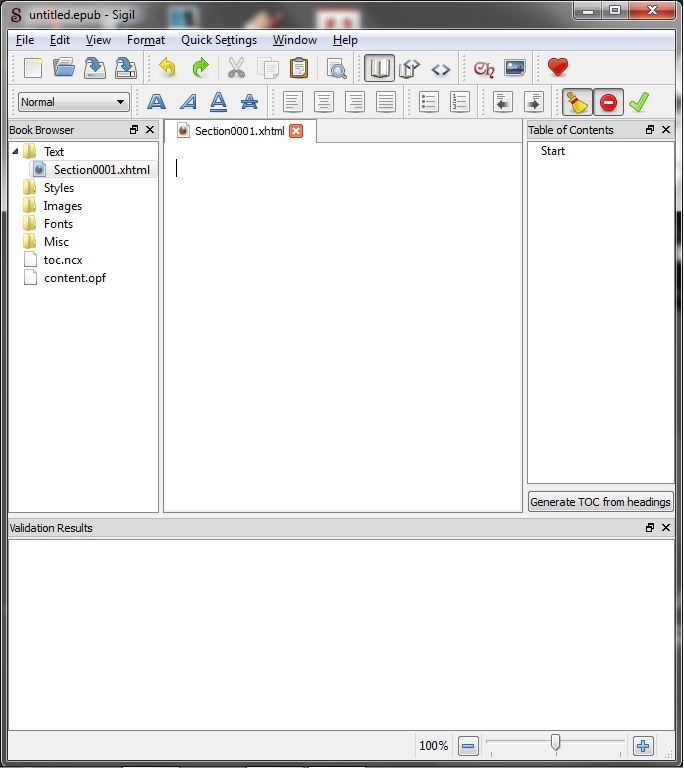 The second way, as well as a useful way to make sure the program has set it as the cover image anyway, is by expanding the images folder in the left hand folder explorer by pressing the arrow (shown in the following image glowing blue). Now find the image file that you want as the cover image, right click its name, and under Add Semantics make sure that the Cover Image option has a tick next to it, if it does not then just click the words Cover Image to enable it. Text can be added simply by clicking in the central box (if you are unsure which one this is then it is the one that has the image in it), this is basically a preview of what your eBook will look like and so the text you type in that box will be the text that appears in the eBook, although different eReaders may apply different fonts or change the size. 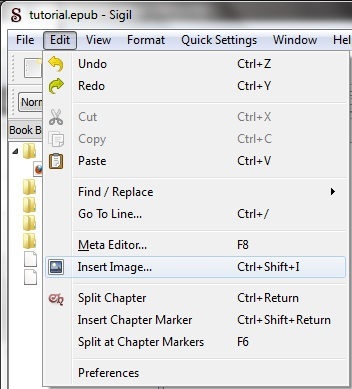 One useful note is that you can copy and paste text from word or similar programs into this window if you are trying to convert a word document into an eBook. 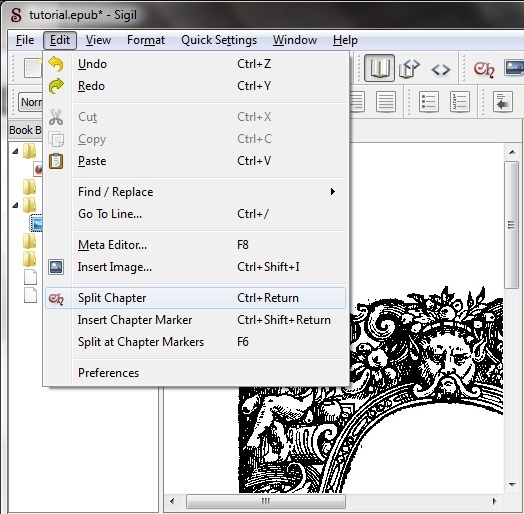 Chapters are a very useful way to simply break up your eBook for easier editting; it basically does what it’s called – a new chapter is simply a new section of your eBook. 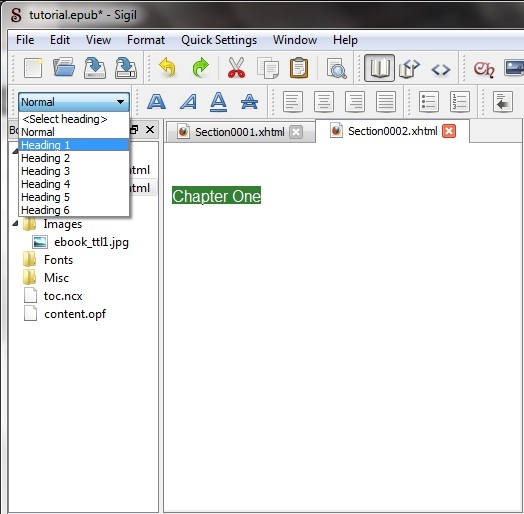 You can add a new chapter by clicking the position in your text where you want the chapter to begin, then going onto Edit and pressing Split Chapter (alternatively you can press Ctrl-Enter). 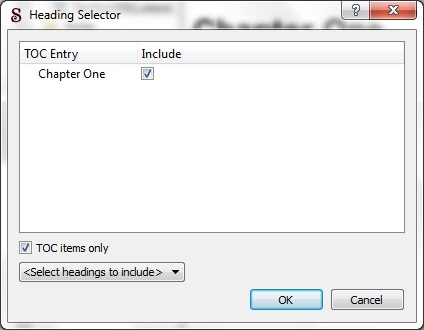 This will have added a new ‘chapter’ into your book and will appear as Section0002.xhtml or something similar, to move between chapters you can simply click the different tabs titled with the different section names. Contents pages in eReaders are just lists of links to different sections of the book, creating these lists only take a few steps and make the eBook much more accessible, however, they are not necessary for an eBook. 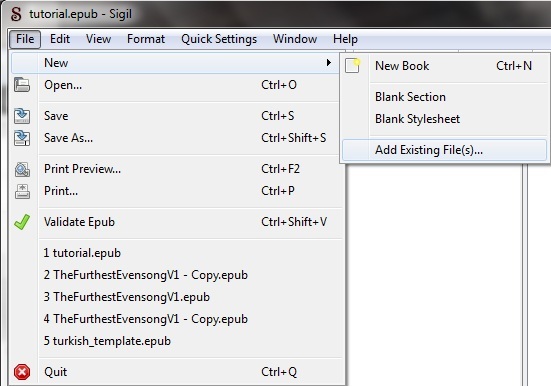 To create different sections that can be put into your Contents Page you first need to tell the program where these sections begin, in Sigil this is done through ‘Headers’. 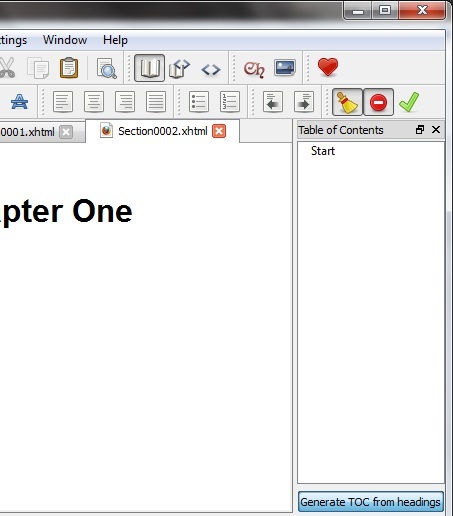 First, find the place in your eBook where you want a chapter to begin, then write the name of the chapter as you would if you were simply writing it there for a person to read. Now, select the text and click on the little drop down menu called either <Select heading> or <Normal>, this is directly above the left hand panel with the list of different folders, from here pick one of the Heading options and you should see the text change. Note: I have had trouble changing the first line of a new section into a heading style, if the text is not changing at all when you select a heading style then try adding an empty line before the text and then changing its style. You are now ready to generate a contents page for your eBook, on the right hand side there is a panel with the title Table of Contents over it, and probably a label called Start listed in it, at the bottom of this is a button called Generate TOC from headings, press it. This will open up a window with a list of all text within the document that has been given a Heading style, check the boxes with the headings that you want to include in your contents page, uncheck any that you simply want as bolder text. Press OK to make all the checked items in the list appear on the contents page. You now should have something that resembles an eBook, make sure that you have it saved somewhere. 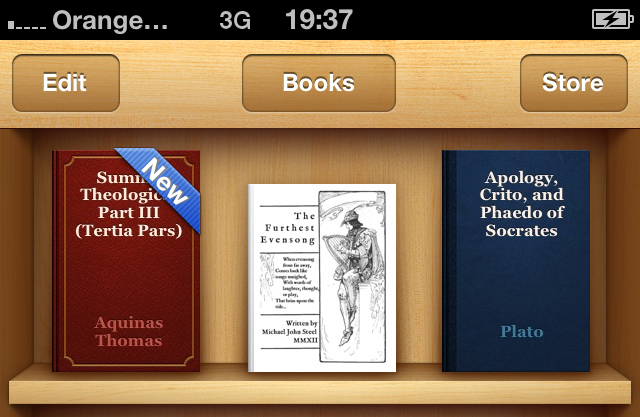 You can now add it to any eReader as you would any other eBook file. I will include below a short explanation of how to add it to an iPhone, iPod, or iPad eReader, since these are the readers I am familiar with. 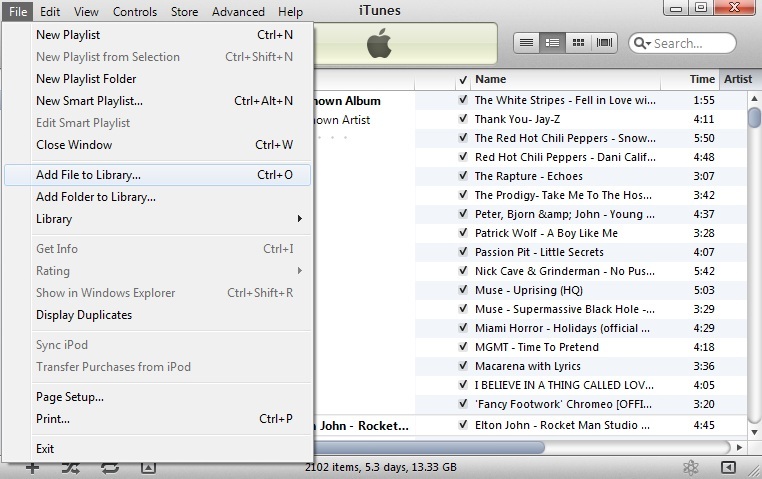 First open up iTunes and go onto File -> Add File to Library, and browse for your eBook. Once you have found the file, double click on it to add it to your iTunes library, you can now sinc your device with iTunes (checking that sincing eBooks is enabled on the device) and your book will be available to read. Enjoy! Overall, this program seems to be an effective and well designed tool for creating proffesional looking eBooks, I would recommend looking into more advanced uses of it once you are familiar with the basics, a tutorial on which I plan to produce at a later date. http://code.google.com/p/sigil/wiki/BasicTutorial – out of date but still very very helpful. 1.8.3: Good luck and Have Fun! Post your questions in the comments, if it’s sensible the answer will be here, if it’s not here’s a picture of a lamb.